“Sherman’s ‘Bummers’ foraging in South Carolina.” Originally published in Frank Leslie’s Illustrated Magazine, early 1865, and reprinted in Famous Leaders and Battle Scenes of the Civil War (1896). Image courtesy of ClipArt ETC. This coming week (December 15–21) marks the 150th anniversary of the culmination of General William Sherman’s “March to the Sea.” On November 2, 1864, after Sherman captured Atlanta, he received Grant’s approval to proceed to the port city of Savannah, 250 miles to the east. Sherman’s army burned much of Atlanta and began the trek on November 15 with 62,000 troops, feebly opposed by no more than 13,000 Confederates, many of them state militia. As Union forces worked their way across Georgia, few people outside the region knew much about their progress. President Lincoln told a crowd on December 6: “We all know where he went in at, but I can’t tell where he will come out at.” Sherman reached the outer defenses of Savannah on December 10 and captured Fort McAllister south of the city three days later. Confederate troops evacuated Savannah on December 20, and Union forces occupied the city the next day. All Sherman’s troops were not bummers, though the name has been made mistakenly to cover all. The “Bummers” were raiders on their own account, really deserters from their own proper ranks, made up of contributions by nearly every corps, division and brigade, who went off on independent foraging and plundering expeditions lasting from a day or two to several weeks. . . . Their conduct was irregular and punishable; but they were not molested by the officers because of their great usefulness. Mallard’s father, who had died the previous year, was Rev. Charles C. Jones, a Presbyterian clergyman and the owner of three plantations, including Montevideo. He was also well known for his writings on religion, including an influential volume titled The Religious Instruction of the Negroes in the United States (1842), which posited the theological correctness of the institution of slavery, advocated the teaching of a Christian catechism to slaves, and warned against separate congregations for black and white worshipers. “The moral and religious improvement of two millions eight hundred thousand persons, must be identified with our individual peace and happiness, and with our national prosperity and honor,” he concluded. The family’s journals, letters, and other papers were published in 1972 as The Children of Pride: A True Story of Georgia and the Civil War, from which this week’s selection is reprinted. 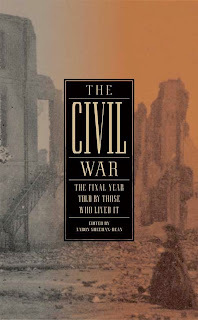 Notes: On page 524, Mallard mentions her brother Lieutenant Colonel Charles C. Jones (1831–1893), a Confederate artillery officer, and her niece Mary Ruth. Colonel Jones had been the mayor of Savannah at the beginning of the war. The Liberty Independent Troop (p. 526) was a mounted militia organized in Liberty County, Georgia, in 1778. Thursday, December 15th. About ten o’clock Mother walked out upon the lawn, leaving me in the dining room. In a few moments Elsie came running in to say the Yankees were coming. . . . If you don't see the full selection below, click here (PDF) or click here (Google Docs) to read it—free!